I was awakened this morning to the faint sounds of “Dreamweaver” by Gary Wright playing somewhere in the distance. Coupled with someone walking around on the old floorboards above, it made for a strange alarm clock. For the next two hours I drifted in and out of sleep, then noticed that the enormous clock read 7:37AM. It’s go time! I jump out of bed, throw on my climbing clothes, grab my pack, stop by the cafe for a tall coffee, and return my room key. I drop my extra duffel bag at the RMI shed for safekeeping and then jump on the bus for the trip to Paradise, the point of departure for our climb of Mount Rainier. After hitting the bathroom, ensuring we all have water, and getting a quick pep talk, we start off at 9:30AM from the visitor center area of Paradise (elevation 5,400 feet). We climb steadily on the asphalt walkway, then further as the trail becomes a mixture of dirt, volcanic rock, glacial melt, and snow. 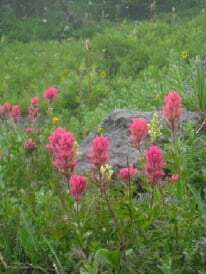 Wildflowers are in abundance at this time of year, the scarlet paintbrush, pasqueflowers, broadleaf lupines, and a myriad of others cast an astounding array of blue, violet, yellow, and red across the green and brown landscape. As we climb higher, we begin to leave the crowds behind. Our plan is to climb an hour at a time, then stop for short 10 to 15 minute breaks to rehydrate and refuel. At 11:40AM we stop to take a lunch break. We are now above the trees and the alpine line at an elevation of approximately 7500 feet. I gulp down water, eat a powerbar, some ritz, and we set off once again. We slowly but steadily ascend the Muir Snowfield, named for John Muir, the noted conservationist who climbed Rainier in 1888. The air continues to thin and breathing becomes tough. As the hours drone on, I start into my rhythm, taking a brief momentary rest at each step. Each pause of a straightened leg adds up over time and helps the body to rest even as you continue to climb. Step 1, breathe, step 2, breathe, step 3, pressure breath. The pressure breath is a forceful exhale of carbon dioxide which helps to pressurize your lungs to absorb more oxygen. Staring at my feet, looking for the subtle changes in the surface of the snow to determine where to best place my next step, then occasionally looking around and admiring the beauty of the creation around me. For me, climbing is elemental, as I begin to climb, a billion thoughts fly through my mind, but as time wears on, rhythm and the next step becomes the focus. I settle into a meditative kind of state, but one that is exhilarating. At 2:45PM we reach Muir Camp at 10,000 feet. Everyone feels strong and we spend time hanging out, taking photos, and organizing gear for the climb ahead. The weather has been wonderful up until this point, sunny and a slight breeze. 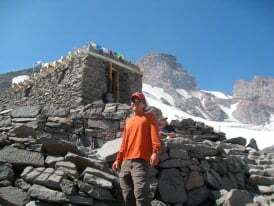 Muir Camp is home to a ranger station, and a few huts, one of which is RMI’s. The vibe here is one of excitement, and with the historic stone and log huts flying Tibetan prayer flags against the picturesque mountain it feels like a different world. At 4:00PM the team gets together for an upper mountain briefing. After the briefing we roam around camp and get ready to settle in for the night, or shall I say the day? The RMI hut is about the size of a rectangular shipping container, but is made out of 2x4s and plywood. It’s chock full of sleeping bunks and can probably hold 24 people or so. I grabbed a lower bunk and put down my sleeping bag, then packed up and organized what was necessary for the impending summit attempt. The guides had hot water available at 5PM. My dinner was freeze dried Cajun chicken and beans cooked with the hot water, then I had some stroganoff-like noodles also cooked in the same manner. I finished it off with an entire package of beef jerky, a red vine, and a few cookies. No time for cooking up here today. Roamed around camp and took some photos. The sky is a bit hazy from the forest fires but the haze mostly looks to be below us. Mount Adams can be seen peaking through the top of the haze. It’s breaktakingly majestic up here. Off to catch some sleep now at 6:15pm. It’s tough with a noisy snorer, a bunch of smelly climbers, and an excruciatingly loud door. Can’t wait for your summit blog post!!! 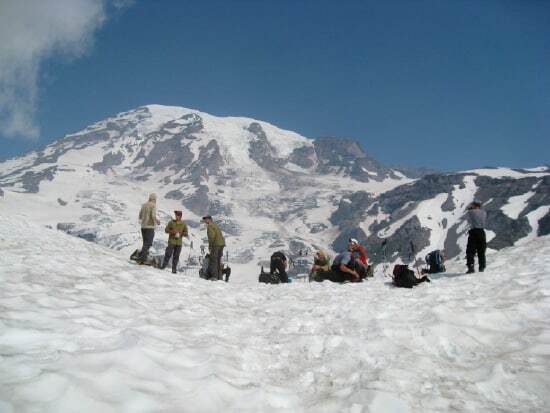 I’m doing the SFS women’s Rainier climb next week with RMI – and I’ve been eating up your blog posts. I think my friend and I passed your team on Saturday as you were heading down and we were heading up for a training hike – complete fog white out, right? Thanks! Good luck on your upcoming climb. We very well may have passed you on the way down. We had beautiful weather on the upper mountain, but it was rainy, snowy, and then turned to white out conditions on the way down from Camp Muir.